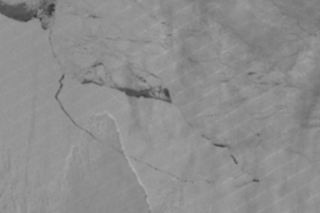 As expected, an iceberg half the size of Jamaica has finally cut itself loose from Antarctica’s Larsen C Ice Shelf. Dubbed A68, the 2,240 square mile (5,800 square km) chunk of ice one of the biggest ever recorded—but what happens now, both to the iceberg and the ice shelf, is anyone’s guess. The calving event was confirmed by NASA’s Aqua MODIS satellite instrument and by the ESA’s Copernicus Sentinel-1 mission. The ESA is currently anticipating a second pass of Sentinel1 over the site to make doubly sure. NASA MODIS thermal image from July 12 2017. The fissure that had been growing for years finally reached the sea sometime between July 10 and July 12, releasing the overbearing chunk of ice into the ocean. The calving event itself wouldn’t have been dramatic to an observer, as the tremendously heavy iceberg will now slowly make its way north into the Weddell Sea. A68 contains twice the volume of water as Lake Erie, but it won’t contribute to rising sea levels because it’s already displacing a huge amount of sea water. The question now is what’ll happen next. The Larsen C Ice Shelf has now been reduced by more than 12 percent, and the complexion of the Antarctic Peninsula has been altered, perhaps forever. The remaining ice shelf is expected to grow in the coming years, but research from Swansea University suggests the region is now more precarious and less stable. There’s a good chance that Larsen C may follow in the footsteps of its neighbor, Larsen B, which collapsed following a similar calving event in 2002. NASA Suomi VIIRS panchromatic image from July 12 2017, confirming the calving. “We have been anticipating this event for months, and have been surprised how long it took for the rift to break through the final few kilometres of ice. 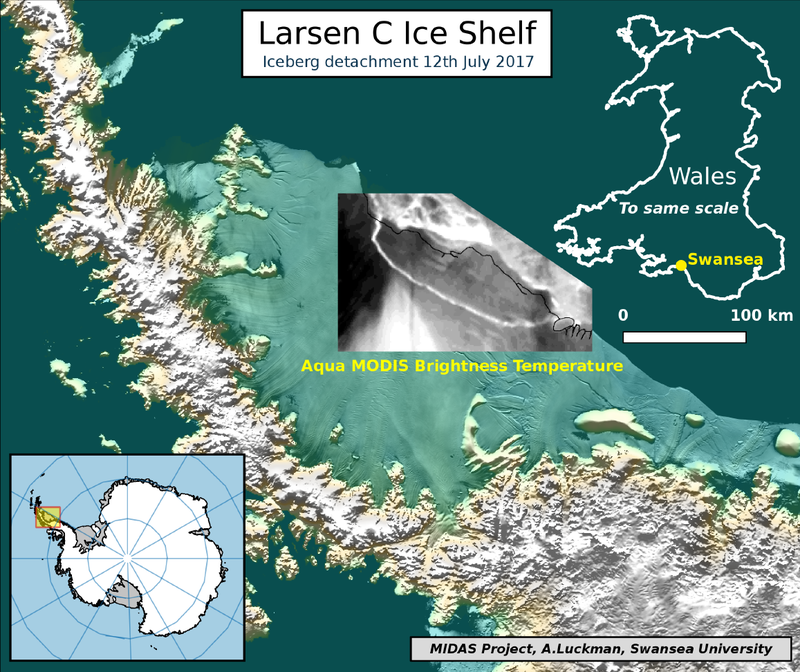 We will continue to monitor both the impact of this calving event on the Larsen C Ice Shelf, and the fate of this huge iceberg,” said Adrian Luckman, lead investigator of the UK-based Project MIDAS, which has been monitoring the iceberg closely over the past few months. As for the iceberg itself, it’s now one of the largest ever recorded, and its fate is difficult to predict. Luckman says it may remain in one piece, but it’s more likely to break into fragments. “Some of the ice may remain in the area for decades, while parts of the iceberg may drift north into warmer waters,” he said in a statement.